A perfect gift for her and ready to ship. Our face planter or face vase is a perfect gift for mother, bridal shower gift, bridesmaid gift or birthday for your bestie. Add your own faux flowers or a few cut garden flowers for a thoughtful gift. Buy multiple of this Face Vase for a girly Bridal Shower Centerpiece, perfect to celebrate the Blushing Bride. Medium: 4-inches wide and 5.25 inches tall. Vase only. Flowers not included. Large: 5.5 inches wide and 6.75 inches tall. Vase only. Flowers not included. $3 GIFT CARD UPGRADE: Our custom gift card can be included in your shipment: See the last photo for example. High quality print on 80-pound card stock. Choose from "Bloom with Grace", "Because Hello! ", or "You are Fabulous". Ships quickly from my Idaho studio. 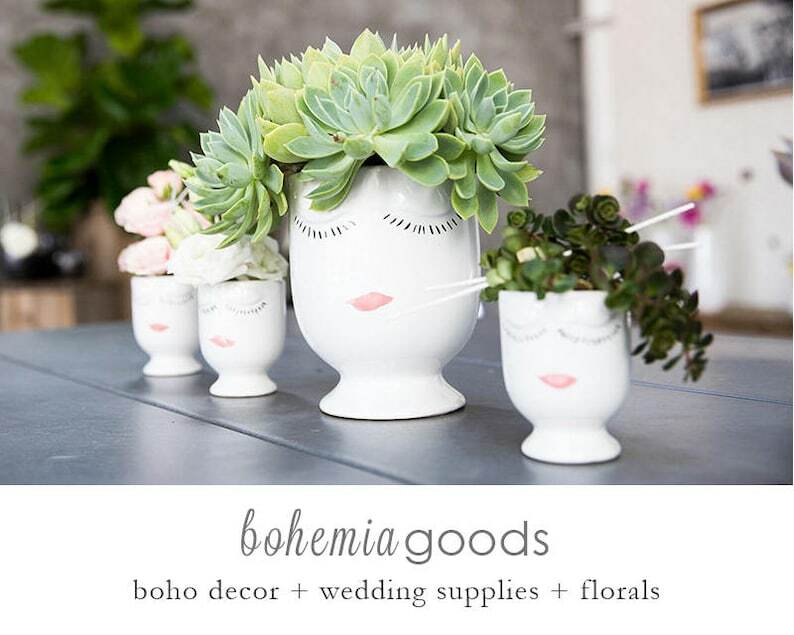 Hi Bohemia Goods! So glad I ordered another one of these gals! Always good to have a set! Thanks!